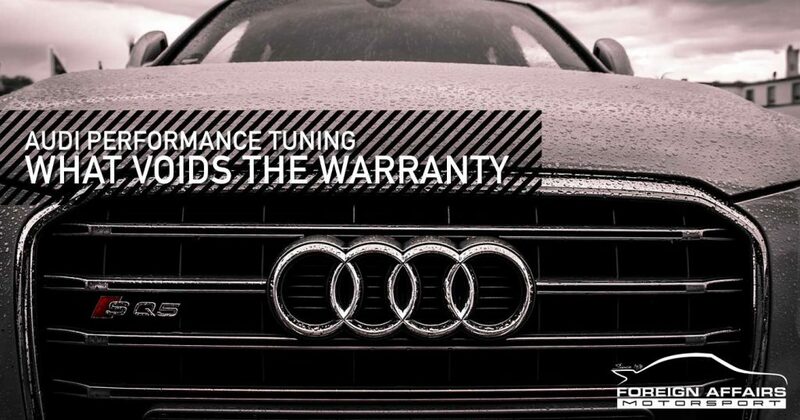 Can Audi Performance Tuning Void The Warranty? You’ve decided to upgrade your Audi and improve its overall performance, making it stand out from the pack. But you don’t want your warranty voided by tuning your car, in case something goes wrong in the future. So how do you turn your car into the best version for you without losing out on Audi’s warranty protection? Firstly, let’s discuss the difference between tuning a car and repairing or maintaining it. Performance tuning is the act of enhancing or modifying a stock vehicle to increase its performance. Repairs and maintenance are necessary to ensure your car runs the same way it did when it left the Audi factory. Why Can’t I Modify My Own Car? Essentially, the Act ensures that consumers will not lose their warranty if they don’t use brand name dealers and shops for repairs and maintenance of their vehicle. So as an Audi owner, the Magnuson Moss Warranty Act allows you to search for cost-effective parts from other dealers without losing your warranty from Audi. If it turns out that the aftermarket or recycled part was itself defective or wasn’t installed correctly, and it causes damage to another part that is covered under the warranty, the manufacturer or dealer has the right to deny coverage for that part and charge you for any repairs. So if, by performance tuning your car, the upgrade causes a stock part to break down,your dealer can void the warranty of that part. For example, if you tune your engine and the next day your sound system stops working, Audi can’t void your warranty or refuse to fix your vehicle. What Performance Tunes Will Void My Warranty? Fiddling with your electronic control unit, commonly known as an ECU, will likely result in the voiding of your warranty. Think of your ECU as your engine’s computer – it manages ignition control, gear position, rpm and many other important parts of your car. Car ECU’s are set to factory settings when sold, and have pre-programmed​​​​ safeguards. Tuning an ECU often allows cars to drive faster, improves brake horsepower and increases top speed. However, when an Audi is taken to be serviced or repaired, mechanics can download encrypted data from the ECU. Because Audi does not endorse ECU tuning, your car will receive the label TD1. A TD1 label means that Audi can refuse to fix any issues that may be caused by your ECU tuning, such as engine issues or even issues with your transmission. Tuning your car’s suspension involves modifying the shock absorbers, springs, swaybars and any other suspension components. Modified suspension improves performance by enhancing a car’s ability to turn corners at high speeds, but can cause problems with weight shifting. Some Audi owners choose to remove certain parts inside their car. Often, this decreases the car’s weight and thus improves performance. Alternatively, modifications such as harnesses can be added to cars to improve safety, particularly when racing.Although ‘gutting’ a car by removing or replacing interior can make it lighter,it will also void any warranties relating to the interior of the car. When it comes to tuning your Audi, always come to Foreign Affairs Motorsport. We’ll make sure that your car’s performance improves to suit your needs without voiding your all-important warranty.